Even with a due date, there’s absolutely no way to determine when you’ll go into labor. Baby could decide to come early, or they may choose to hang out in your womb for longer than expected! 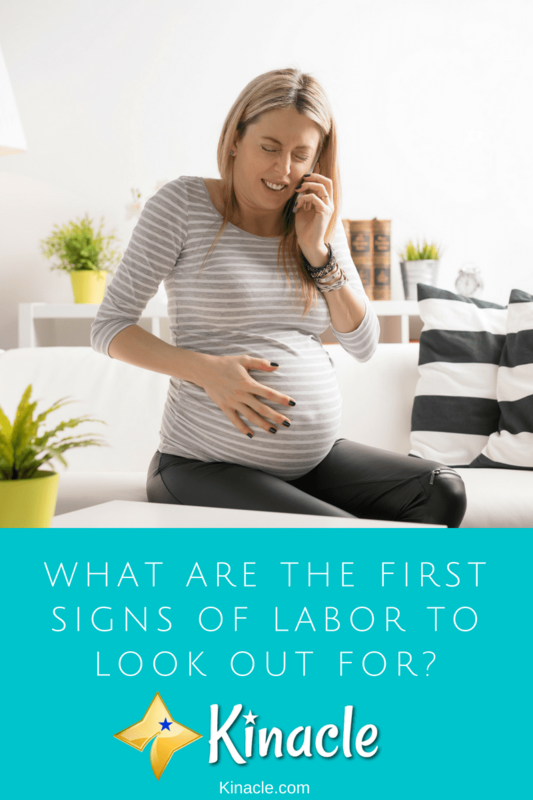 However, whilst it isn’t possible to know when labor will begin, it is possible to look out for the early signs of labor once your due date is approaching. Did you know that your body will start preparing for the labor up to a month before you give birth? This means you’ll start noticing different symptoms cropping up during the third trimester. Here, you’ll discover the first signs of labor to look out for, so you can prepare both you and your birthing partner for the big day. If this is your first child, approximately a few weeks before labor starts, your baby will start to drop down into your pelvis. If it’s not your first baby however, this won’t usually happen until you’re actually in labor. It’s basically your little one preparing to exit the womb. As they drop down, you’ll likely find yourself waddling just that little bit more than usual. You’ll also feel the need to urinate more (yes, even more than you do right now! ), as baby’s head is pushing onto your bladder. It’s not all bad however. As baby is now further down in the body, your lungs are given plenty more room to breathe. During the third trimester, it’s not uncommon to become more tired than usual. In fact, it can feel like you’re right back in the first trimester once the tiredness kicks in! It’s understandable really, given how big baby now is and how tiring it can be carrying them around with you! So, if you start to notice you’re permanently tired, it could be a sign baby is almost ready to come out. Alternatively, you could be taken over by a sudden need to “nest”. This means, cleaning everything in sight and getting the home ready for baby. During this short phase, you’ll have lots of energy! Just remember not to overdo it. Braxton Hicks contractions can be really scary when they first start happening. They actually first start to show up during the early days of pregnancy, though many women don’t even notice them. This is because during the early stages of pregnancy, Braxton Hicks are often painless, irregular and they don’t occur very often. However, once you’re nearing your due date, you’ll find these contractions take on an entirely different form. They become more intense, more frequent and they can be pretty painful! They’re often mistaken for real contractions due to how intense they can be. You may also start to experience what feels like menstrual cramps around the same time too. Just when you thought your morning sickness days were behind you, late in the third trimester nausea can make a real comeback. It typically occurs at the same time as Diarrhea too, making it even more miserable to deal with. The reason Diarrhea and nausea develop late into the pregnancy, is because your baby is growing. As they grow, the uterus starts to protrude into the GI tract, causing issues with the digestive system. However, it could also be an early sign of labor so it’s worth looking out for these changes. As your body prepares for the birth, the joints and muscles stretch and move around. This can cause cramping and back pain. However, back pain can also be caused by the general added weight of carrying baby around. The back also starts to curve more to accommodate baby growing inside you, which ultimately leads to increased pain and cramps. In the weeks, or even days, before labor, your cervix will start to prepare itself for the birth. It begins to thin out and open, as the connective tissue changes. You’ll typically find your physician will track the changes of your cervix at your weekly appointments, just to see how you’re progressing. It’s worth noting that every woman’s cervix starts to change at different times. So, don’t be alarmed if changes haven’t started occurring yet. If this isn’t your first baby, you may even find these cervical changes don’t occur until the actual day of labor. If the cervix changes dramatically in the lead up to labor, you’ll likely pass your mucus plug. This is basically a small amount of mucus which has a slightly bloody appearance. So, don’t be alarmed if you notice a small amount of bloody discharge in the lead up to labor. The mucus plug is there to basically seal off the cervical canal. In the lead up to labor, it isn’t really needed, so that’s why it’s eliminated from the body. The plug can come out all at once, or it may leave gradually where you notice a small amount of bloody discharge over a period of a few days. One of the final early signs of labor is when your waters break. Technically, this is the start of labor and in the movies, it’s portrayed as a significant amount of watery discharge which comes flooding out. In reality, this doesn’t always happen. In fact, it could turn out as more of a trickle of watery discharge running down your leg. You may even feel more like you’re urinating. However, if you squeeze your pelvic muscles and it doesn’t stop, it’s more likely to be your waters breaking. So, there you have it – the earliest signs of labor to look out for. Understandably, it can be pretty scary when the signs start to show. However, if you’ve come up with a detailed birthing plan, the start of labor can actually turn out to be more exciting than frightening!